$43.00 & FREE Shipping on orders over $59. The American Homebrewers Association (AHA) is dedicated to promoting the community of homebrewers and empowering homebrewers to make the best beer in the world. The AHA is a not-for-profit organization with more than 43,000 members. Join or renew with the AHA to be part of the community. 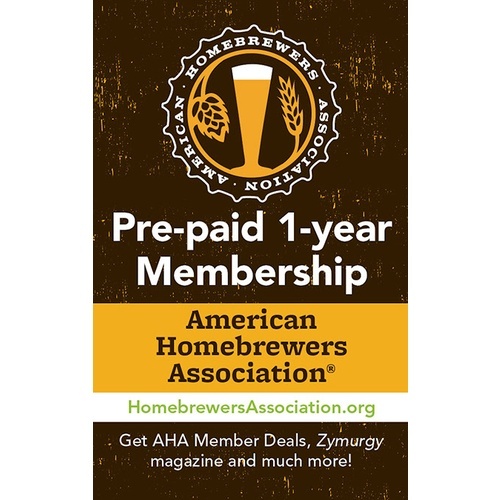 Benefits of membership include Zymurgy magazine, eZymurgy and Zymurgy app, AHA Member Deals discounts on food, beer, merchandise and homebrew supplies across the country, access to the Great American Beer Festival® Members-Only session/ticket sale, access to AHA National Homebrewers Conference registration, free entrance to AHA Rallies, discounts on Brewers Publications new releases and AHA National Homebrew Competition entry fees – and more! Joining the AHA helped me feel like part of a nationwide network of homebrewers. It's worth the annual dues just for the subscription to Zymurgy magazine which features homebrewing news from around the country as well as great recipes, historical features, and lots more useful stuff. I like supporting those who support me. Plus the ability to go to the NHC. Plus Zymurgy, a great magazine with useful information. Plus discounts across the country. Most discounts are on glasses or clothing that I don't need, but a few breweries give a discount on beer, or even a free flight!